Gum/Periodontal Treatment : Oral prophylaxis, subgingival curettage, Flap Surgeries, Bone Grafts, Guided Tissue Regeneration, Periodontal Plastic Surgeries, Gingivectomy, Crown Lengthening etc are done here. Dental Implants : We replace single / multiple lost teeth by using osseointegrated titanium dental implants with FDA approval eg: Endure, Oraltronics etc. Implant supported Complete Dentures are also fabricated. Oral and Maxillofacial Surgeries : Treatment of maxillofacial fractures, surgical Extractions, including Impactions is performed here. Ceramic Crown and Bridges : Replacement of lost teeth using All Ceramic, Ceramic fused to Metal, Veneers etc. Cosmetic Restorations : Tooth - coloured composite restorations, All ceramic Crowns, Veneers, Diastema closures etc. 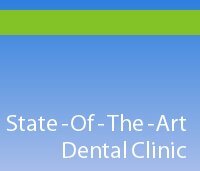 Smile Designing : Use of Veneers, All Ceramic Crowns, Cosmetic Gingival Surgeries etc. 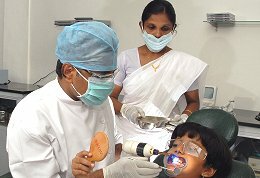 are done to enhance the patients smile. Root Canal Treatment : Single - sitting RCT using Protaper Nickel Titanium rotary instruments with endodontic micromotor - X-Smart (Dentsply), Apicectomies etc. are done. Orthodontics : Orthodontic tooth movement using Begg and Straight - Wire Technique functional orthopaedic appliances like Frankels appliance, Bionator, Herbst appliance, Twin - Block appliance, Head-gear, Chin-cap, Space Maintainer are used. Invisalign Technique, Tooth Coloured Ceramic Brackets, Lingual Orthodontic, Adult Orhodontics, Micro Implants in utilated cases with posterior tooth loss are the specialities offered here. Teeth-Whitening : At our practice we follow the most advanced chairside teeth - whitening system --- "Zoom". It is an effective, fast and safe procedure that can be completed in a single 'one hour' appointment. It is ideal for busy individuals looking for immediate results. Log on to www.zoomnow.com for more details. Geriatric Dentistry : Total rehabilitation of the dental arch including Periodontal Surgery, replacement of teeth crowns, restorations, Extractions, Dentures, Implants, etc. Pedodontic Dental Care : Pit and Fissure sealants, restorations, Root Canal Treatment, Preventive Orthodontics, etc.